Are you one of the growing numbers using an e-reader? Do you have a Kindle, Nook, Sony, or some other brand? A recent Harris poll showed that three out of every ten US readers us an e-reading device of one brand or another. And 13% of those polled who didn’t own one said they would be buying one in the near future. This month that rose to 15%. · Convenience – Never be without a book again. When traveling, your suitcase doesn’t have to be weighted down with twelve books just in case one or more are boring. · Dust free – If you’re one of the many allergy sufferers, your nose will thank you for cutting down on dust mites. · Games - The ability to play games like Sudoku and Bejeweled. · Novellas – For a quick but satisfying read, novellas are almost always the way to go. Fortunately lots of authors and publishers are picking up on this. · Free books – A great deal of publishers offer a variety of free books. While this may sound like a negative for authors and royalties, it’s turned out to be a huge positive. People find new authors and go on to buy their other books. · Samples – You can sample the book before you buy it. Of course you can do the same thing in the store, but there isn’t always time to get a true feel for a book when browsing in the store. Some samples are longer than most, but there’s usually enough there to determine whether or not you like the writing style and want to keep reading. If so, you simply click “buy now” and the rest of the book loads. · Library books – If you’re germaphobic, you no longer have to worry about germs. Most libraries now have downloadable e-books. · Re-releases – It’s great when an author makes their out of print backlist available for downloads. It gives readers a chance to reread books they once loved and it gives them the chance to read books they might have missed. Example: Sharon Gillenwater’s Buckley, Texas series. · Authors stretching their boundaries – it’s wonderful when an author wants to write in a different genre. Example: Lisa Bergren’s YA River of Time series. · Bigger purse – You will likely need a bigger purse to carry your e-reader in if you’re always going to have a book with you. · Color screens – If you have one with a color screen, you likely find it difficult to read in direct sunlight. If you wear Polaroid sunglasses, reading in the sunlight just became nearly impossible. · Games – The ability to play games like Sudoku and Bejeweled. · Short stories – Yes, this sounds like an odd one to put in the “con” section, doesn’t it? It’s great that many authors are writing novellas and loading them onto B&N and Amazon. Novellas usually sell for .99¢ – $2.99 and are usually between 80 – 100 pages. But what happens when you download one by one of your favorite authors and it’s only 20 pages? Do you feel ripped off? After all, it’s only 99¢. But wait – what if that 20 page “novella” is really only a teaser to tempt you to buy the author’s next book? · Re-releases – If you’re an avid reader then most of the time you will know you’re downloading an older book. But not every publisher and/or author who releases out of print books states upfront that these are out of print books and you may end up with one you’ve either read before – or didn’t read because you hated it. · Authors stretching their boundaries – Um, imagine this…. One of your favorite authors has a new book available for download. It’s not published by their usual publisher; instead it’s made available by the author. Said author happens to write inspirational romantic suspense. You download her new book and it’s full of things that wouldn’t ordinarily be in an inspirational romance – things most inspy readers don’t want to see in a book. Even worse than this unpleasant surprise is when you download a sample first “just to make sure” and it’s a very short sample listing all of that authors inspy books. Note to authors: We love that you’re stretching your boundaries and doing some self-publishing. But if the reader is used to reading your inspys, please state up front that this is not one of them. And if you don’t state it up front, then please don’t list your inspy books on the front page of your new self-pubbed book if your self-pubbed book is full of things that are taboo in an inspirational. · Changing technology – With changing technology there is always something “better” on the horizon. If you’re one of those always tempted by the “latest and greatest” get used to the fact that you can’t keep up unless you’re willing to buy a new e-reader every six months. Unlike technology which changes almost daily, God is unchanging. It’s such a relief to know that He is the same today, tomorrow and yesterday. We don’t have to ride the technology hamster wheel to keep up with God. So what do you think of e-readers? Love ‘em or hate ‘em? Do you have a different list of pros and cons? 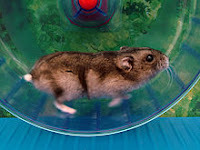 Suzie Johnson is trying to get off the hamster wheel. She has purchased way too many e-readers and vows to only buy one more. She does not, however, vow to stop buying purses to accommodate them. Coming out of hibernation to comment on this one. I love my e-reader. (I'm on my third.) I saw a quote the other day, something to the effect that e-readers are a threat to books in the same way elevators are a threat to stairs. Reading is up, and I think that's a great thing. If a new gadget inspires that, wonderful. I might try the library soon, only their collection of what I want to read is pretty small. But still, there are some bargains out there, too. I have an older kindle with a keyboard, and I love it. No cons that I can think of. It has electronic ink rather than a color screen. I have a lovely red leather cover with a light that feels like a real book and makes it perfect to read anywhere. I often have it read out loud to me, since the ereader feature is faster than my normal reading speed. Only the non-fire kindle has this feature that I know of. I love that I can change font sizes. It's also great for editing. And yes...I've been taking great advantage of the freebies. El-cheepo e-reader works pretty well, except I have to page through the 100 free books that came with it. Not sure how to compartmentalize on it (or if it can - guess I should inspect the About This Reader document, eh?) The only drawback is no real freebies available unless the author has a personal freebie link. I cannot with clear conscience purchase another Kindle or e-reader. I do want one though. I cannot give the hint to hubby because our finances are unified and again, I consider the ereader a luxery item. I do still like "real" books, except that I've too many bookshelves filled already. I guess I must start to wade through and keep only my uber keepers - the books I can pass on to my children and grandchildren. Love both. Love reading, but that's just me. I'm still using the eReader I bought second hand in the Sony test drive program. It's a Sony 700 and I really like it because it allows me to read at night without supplemental lighting, and it works great in sunlight. I usually only use it to read manuscripts, although I bring it for reading pleasure when I'm travelling. Because it's one of the 1st versions, it doesn't hold a charge for more than a few hours. I use my iPhone for most reading whenever I grab a moment, like standing in line, sitting in a waiting room. etc. I still enjoy holding a printed book in my hands. For some reason, it brings back memories of lazy summer afternoons or getting comfy on a couch on a rainy day. In other words, I feel more relaxed when I hold a book. I really like your list of pros and cons. I'm interested in an e-reader. I think one pro that wasn't mentioned (or I missed it somewhere) is the instant availability of books. Want to read something right now? BOOM. There it is, right on your e-reader. No shipping cost or delay. Hey you all, so sorry I'm late. I've been working super hard this morning and couldn't take a break until now. Barb, I'm glad you came out of your cave for a few minutes, and I love your quote. Dina, as far as I know, my nook does nit read to me. I think that's a very cool feature, especially for editing. Thank you, Anita. I totally forgot about the reading in bed part. I may not be able to read the color Nook in the sunlight, but I sure can read it in bed because of its lovely backlighting. So that's a definite pro. But on the con side - it always flops forward and hits my nose when I fall asleep. It's heavy, so I halfway expect to wake up with a black eye one of these days. DeAnna, you're so right! Instant availability and I love it. I can't believe I forgot that wonderful fact. Also, since many bookstores take books off the shelves after a specified amount of time, it's so good to know we can still get the book electronically. I have the "old" (when did we start referring to things that are 5 years old as OLD?) Kindle with the keyboard. IMHO, it's not terribly user-friendly, but I like it for reading outdoors and the read-aloud feature. Since getting my iPhone 2 years ago (it's not old yet, right?) I've started using its Kindle app for most of my e-book reading. My least favorite thing about it? Screen size. Most favorite? When I need a "book fix" (you junkies will know what I mean) I can satisfy the urge instantaneously. My biggest complaint? The horrendous lack of editing that goes into the majority of e-books I've read. Silly things... things that SHOULD have been caught by someone before they hit "PUBLISH." It makes me want to send snarky emails. I like my kindle fire. Unfortunately, I also like Scramble with Friends, WWF, and Cross Me. I get easily distracted. The kindle has been fabulous for downloading old editions/OOP books for research. I needed to know how to ride side saddle...and found an old English book with instructions, perfect for my heroine. The 1811 Dictionary of the Vulgar Tongue (British) was also free for e-readers...so handy to have it on my kindle. By the way, if you figure out how to get off of the hamster wheel, let me know. Let's go purse shopping sometime! I know what you mean, Niki. I think the ever changing cell phone merry go round has taught us to "think" things are old when they really aren't. It really is crazy, isn't it? But I do love my Blackberry. Susie, I didn't think about antique books. I mean, I downloaded some when I was doing my history class, but forgot about it when writing this. It's a great idea, and also I found some realky cool family genealogy publications on there!